Not happy with the first go at this so here's a better version with some piccies from the albums. Scanning photo album pages that are nearly thirty years old was a pain. And I may have ended up digging through some other albums as well. As you may already know I’m rubbish with technology, so have forgotten how to upload music on to my ipod. Well I can remember, but it’s easier to go on to YouTube to find the music I like and listen with headphones which nicely blocks out the new F1 season. So this last week I’ve been listening to music and out of the blue I decided to investigate what, if anything people had put up about one of my all-time favourite bands. I’ll give the name, but I doubt you’ll have heard of them; Fields of the Nephilim. Whenever I say their name, most people even of my age stare blankly at me, but in some parts of the world and amongst certain groups they were and still are hugely popular. They aren’t what you’d call a commercial band, though they did reach the British top thirty in 1988 and gained many number ones in the British Independent charts. They had something more durable than chart success; cult status and were the band the cool people loved to hate. Especially NME readers. Yes I really did leave the house looking like this. 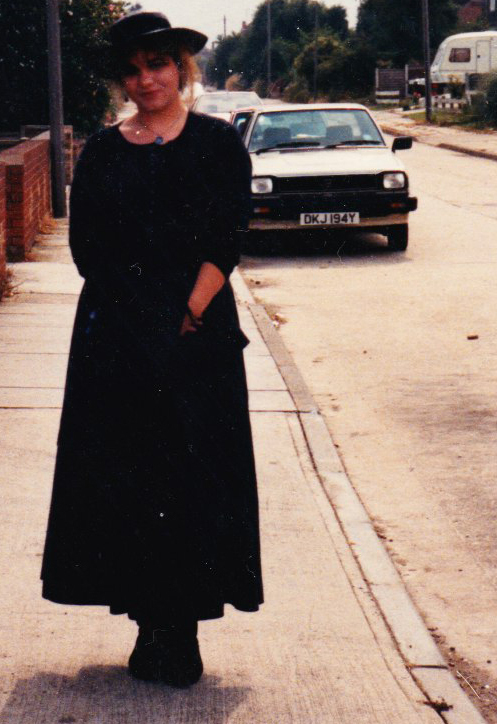 1988 outside a friends house. The Nephs were a band from Stevenage who invented the concept of the cowboy goth. Many called them pale imitations of Sisters of Mercy, (who I also liked a lot), though for those who loved the Nephs they were much more than a band, they were a whole concept. Most people dismissed them for their image and the monstrous vocals of Carl McCoy who sounded like a devil drowning in a drain whilst gargling on razor blades. But he wanted that, he used his voice as an instrument and it was an intrinsic part of the whole concept and sound. For those who managed to get past that or heaven forbid actually like it they would have heard skilled and experimental musicians who knew how to write memorable tunes and to create complex multi layered songs which even after all this time, don’t sound dated and still have the power to move and evoke emotions. Then there were the lyrics which were so intriguing and mysterious they fired thousands of imaginations, not only mine. I don’t know how many times I saw them before they went their separate ways. Quite honestly, I lost count. I wasn’t a groupie. Heaven forbid. But my friends and I did follow them to the back of beyond and home again, much to our parents’ bemusement. We did it in style though. No bus stops and kit bags for us. We stayed in B&Bs and either arrived at the venue on the National Express (British coach company) or in cars. It cost a fortune, especially Germany. But they were some of the happiest days of my life and the nights were even better crushed up against a barrier listening to one of the best live bands ever and being part of the whole show or ritual. We discovered them in 1988. My friend, Mandy and I had just been to see Hothouse Flowers who had a hit that year with the glorious single ‘Don’t Go.’ Not many groups travelled to our neck of the woods in the south east of England as it was too close to London to be worthwhile. So if we wanted to see any one we had to jump on a train and cross London to see any bands unless they played at Brixton Academy which was easier for us to get to. Hot House Flowers had come to Folkestone and blown our socks off. It had been a wonderful gig and the fifth only in my life at that stage. Three I’m proud of, the others well…. I wouldn’t go to see them again, let’s put it like that. So when we heard the Nephilim were coming as well we were intrigued. We’d seen a clip of their video for their latest single ‘Moonchild’ on Top of the Pops and we’d liked their alternative look. At that time we were bored of bland people like Belinda Carlisle and Bros were riding high in the charts to our chagrin. We were heavily into U2 and Echo and the Bunnymen, much to our other friends’ annoyance and bemusement. "Why can’t you be like us and listen to normal bands like Belinda Carlisle? Why do you always have to like different things?" That’s what a friend said to me that year. I know because I wrote it down and put it in my diary. Finally, I’d officially achieved my ambition to be weird or alternative as we called them back then. This was also the time of Stock Aitken and Waterman. So enough said, though some of their songs were brilliant. The 80s were great but some aspects of the music were not and no amount of time and distance will change that for me. I still cannot get all misty eyed over most of what came out of the SAW hit factory. Anyway we liked the look of these Nephilim and at that time Woolworths did a music magazine which either came out weekly or once a month. I forget which now and we saw a tiny interview with the Nephilim singer Carl McCoy who listed some of the songs he liked. To our surprise we agreed with a few of them; such as Joy Division’s ‘Transmission’ and Magazine’s ‘Shot by Both Sides.’ They’re the only ones I actually remember; please bear in mind it was twenty-nine years ago now. I could check though, as I probably have the cutting somewhere. So the four of us, Karen, Mandy, Lena and I decided to go and see them in Folkestone. We were never the same afterwards and none of us have regretted going that night. For a few years it changed our lives and the reverberations still rumble on to this day. It was the 12th September and I’d spent the day painting the outside ground floor windows for my dad. He was getting me to do odd jobs around the house because I’d changed my mind about studying sociology at a London Poly and instead had set my heart on reading Classics at either Warwick or Kent University. When not painting I was supposed to be trying to get a job to keep me busy during this unplanned gap year. So off we went to see the band, us innocent babes with no idea what was in store for us. The place was packed full of black clad people, many of whom were dressed as cowboys, though a large group of heavy set young men were wearing workman’s clogs from the nineteenth century. It seemed most bizarre to us, though we were soon to find out why they wore them. I have to say we never, ever wore them, or cowboy boots either for that matter. We stood near the front thinking how lucky we were to be so close to the stage because it meant we had a good view of the band. Then the lights went down the dry ice machine started and the stage disappeared. (I’ll never forget that smell.) Floured hats emerged from the gloom. It was mesmeric. We’d never seen anything like it. The band played a slow, lazy number, but the singer didn’t emerge, though to our surprise the crowd started to move in time with the music which had a steady rhythm as if something was waking from sleep. We moved as well, thinking what a jolly show we were in for and how lucky we were to be at the front. Then the band changed key and the pace of the music increased. Instantly the crowd adapted and began moving a lot faster and though caught in energetic melee, we believed it was survivable. How wrong we were. But then without warning the music increased in tempo again and the audience went mad, though the singer was yet to appear on stage. We realised now this was part of the build-up and it was working. The locals and loyal followers were going crazy and we were caught up right in the heart of it. Then some clog wearing enthusiasts started to climb on to the stage so they could jump into the audience head first. Stage diving and others started crowd surfing. We were crushed and people were falling all-around us as more and more fans fell headlong into the crowd, whilst others climbed up onto each other shoulders. Later on, we discovered that these same people made pyramids in the slower songs, which as you can imagine made great windows for those unfortunate enough to be stuck behind. Naturally we tried to escape the crush and falling bodies. In the chaos we became separated as we each tried to make our way to the relative safety of the sides. Somehow, I made it out without injury and waited at the back for the others and watched as Carl McCoy finally made his appearance. He was greeted like a messiah by the frenzied crowd who appeared to worship him. If it had been bad before things became a darn sight more manic once he arrived, though he remained oblivious to the adoration he invoked which was all part of the magic. "Why can't you like normal stuff like Belinda Carlisle?" Mandy found her way out next and I saw her emerge through the transfixed crowd with a manic look in her eyes whilst grinning like loony. I beamed back knowing exactly how she felt. Soon after that Lena made it out and I think she had a cut lip, but nothing more. Karen had completely disappeared which was amazing as she’d worn a white coat. She’d stood out in the sea of black clad people as only a neophyte symbolising their innocence at the ceremony like this can. None of us ever made that mistake again. But of course, we’d been initiated by then, so knew the rules. Though none of us ever made it to smelly clog wearing status. Second level only, methinks. Eventually she re-emerged on the other side furthest away from us and it was about five songs in when we finally spotted her now grey coat. But we were hooked. We’d never seen or experienced anything like it. The atmosphere was electric. The theatre and staging was incredible. Though I can see why most people would see it see it as pompous and ludicrous. The sound was incredible and our ears were ringing for days afterwards. Back then it was our sign for a good gig. Now it means I’ve an ear infection. How times change. That was the first of many concerts for us. We went back time and time again for more. Mandy and I went the most often to see them and soon became familiar with all the songs. We used to take used set lists as mementoes of the gigs we’d been to. I bought old magazines to read back over old interviews and we all bought everything they’d ever recorded and a lot of stuff they’d never officially released but had played live. If you know what I mean. We also investigated other bands they mentioned in the interviews and soon were off travelling around the country to see Red Lorry Yellow Lorry, New Model Army, the Godfathers, and the Levellers to name the few first which have popped into my head. Suddenly all this new music was opening up to us, though we remained the only black clad people in our home town. Tracksuits and polo shirts being more the norm. There were no clubs or pubs in our local area where we could hear or dance to this new music we’d discovered, so we stayed in and drank Vodka, because we read somewhere that it was the band’s favourite tipple. We invented Neph cocktails and a Neph board game, based on trivia pursuits with questions cribbed from the various interviews. E.g. who produced the first album DawnRazor? I have no idea who that is now. (Bill Buchanan for most of it. Ed.) Cocktails included Vodka and appletice; Paul Wright’s Delight. Vodka and bitterlemon; Pete’s Treat. Vodka and black; Carl’s Brew. Vodka, cider, lager and ale; a Neph bootleg. You get the gist…. And yes, I do remember them all. We even dressed up, threw flour on ourselves and stood in fields and graveyards. We normally roped my Mum in to take the photos and poor old Karen was gifted even worse braces because she got to be Nod Wright, the drummer. When we went to see them we learnt to stand at the barrier so you could put your leather jacket over the side for padding whilst being as close as possible to the event. It was also well out of the way of the NMA fans who wore the clogs and made the pyramids. They were the ones who also occasionally slam dived into the audience, though they preferred to crowd surf. I rather liked the skill and grandeur of the body sculptures they produced in homage to the band and they seemed the perfect accompaniment to the music. Though I was less keen when they played windmills in the middle of the crowd. Two of them would take each other’s hands and they’d spin around until they were going really fast and then let go so they’d career into the people standing closest to them. Jolly annoying if you were caught up watching. We kept well away from them during the concerts but soon befriended several of the group who turned out to be lovely people. Hello Trixie, Colin, Mike if you’re reading this. We also learnt never to stand in the middle. Everyone wants to see the singer there was always a lot of madness there, but the sides mercifully remained relatively calm. So we normally stood in front of Paul Wright, the eccentric guitarist or on the other side, facing Pete Yates, the other guitarist and Tony Pettitt the bass player. It was much, much safer and you had a fantastic view without any interference. From that vantage point you’d feel caught up in the heart of things, but you could get out if you needed to. Perfection. I’ve passed these nuggets of information on many times to my students over the years. Later on a few years later we heard from the band that Folkestone had been one of the craziest nights they’d ever played. They thought as we did, that the madness was due to the fact that hardly any bands ever played there due to its proximity to London. We’d been there and we survived. Full credit to us. Though memorable it wasn’t my favourite concert of theirs. I think that has to be Aylesbury in 1990. At the time the hottest concert in Britain on record. But that was few years ago now and the temperature has probably long been surpassed. So why am I writing about something that happened twenty-nine years ago? 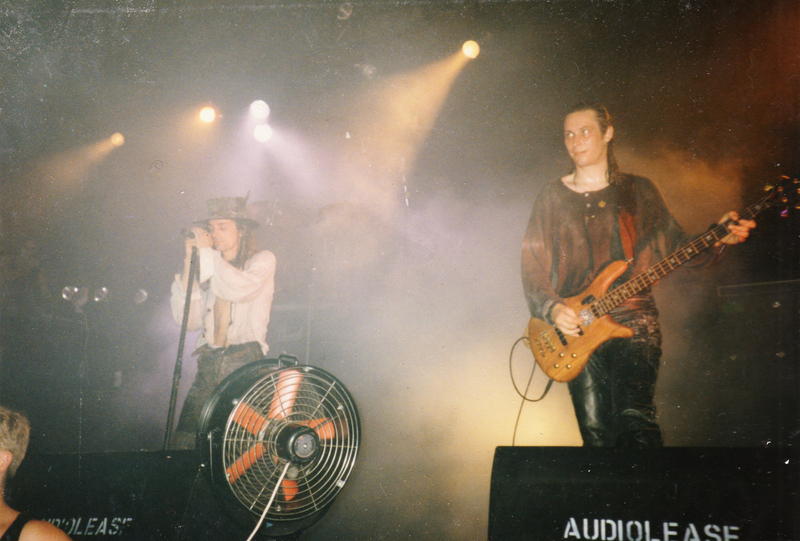 A few days ago during my travels on You Tube I came across what I believe is a recording from the sound desk, of the Fields of the Nephilim concert from the Hummingbird, Birmingham in 1990. Mandy and I had been at that gig, though it wasn’t the best night for us. Mandy’s car was broken into after the concert and her radio stolen. Strangely they’d left most of the tapes. Not Neph fans obviously. When I heard this concert again, everything came flooding back and I remembered just how brilliant they’d been. Wow! After that I found other recordings and soon it was like watching and listening to the Nephilim again. Something I believed had been lost forever. Carl’s new stuff is brilliant. I have it all, but I’m listening to it again now with renewed new passion and ear, inspired by those old concerts which have reawakened my lost love. Also, the art design is stunning. The striking visuals concepts always added to the drama and mystery of the band, from the idea of yellow eyes and Freddie Kruger gloves of the enigmatic preacher man to the simplistic beauty of the arresting occult symbols and monastic medieval parchment. I had many posters, the best one I had was the promotional poster for the ‘For Her light’ tour. I loved that design. I could sit and study it for hours. Though I loved the ‘Sumerland’ cover, the piece of wheat in the hair of the face somehow hit the right note hinting at fecundity and yet also sacrifice. I know Carl’s played live recently and I was due to go to the latest concert with my niece who’s fan as well, but I was ill with suspected labyrinthosis, so had to miss it. She said it was amazing. It the first time she’d ever seen them and blown away. Nice to see they still have the same old magic which can change your life. Though she chickened out and didn’t stand at the front as I advised her to. I cannot get over how brilliant ‘Mourning Sun’, Carl’s latest album is. It’s definitely stirring my imagination and soul in exactly the same way his music did in the past demanding that I investigate and explore mysterious ways. This time though, I now have a vent for the creativity inspired by the intriguing combination of the captivating music and enigmatic lyrics. Instead of wanting to know more about the band and mystical things they hinted at in their songs, I’m inspired to write a story or a series based around the Biblical watchers mentioned in the Book of Enoch. In fact I’ve already written one short story and am part way through another. I suspect this idea has been burning away inside me, lurking at the back of mind for about twenty-nine years. So, I don’t want to rush and ruin everything. I have a beginning for this concept and maybe in time it’ll grow to be another series. There’s no doubt that night in September 1988 changed my life. 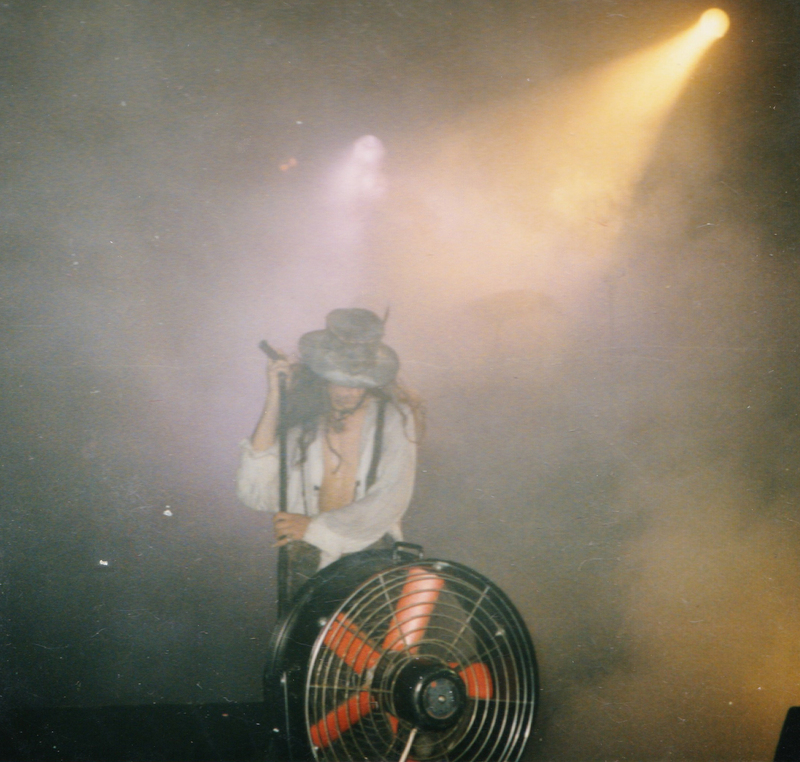 Fields of the Nephilim and everything they stood for, their whole concept gave me permission to be interested in my own spirituality and inspired my fascination with the supernatural and ancient myths. Oh, and in the meantime, we’re getting together and having a Neph night. Many vodka cocktails will be consumed and I’ll dust off my copies of Forever Remain, Visionary Heads, Morphic fields and Ceremonies. Though we might just simply want to dance like we used to do to the wonderful music. We might be a bit stiff in the morning, but it’ll be worth it, just to feel that magic again.